As part of International Typewriter Appreciation Month, I’m telling some stories about the importance of portable typewriters to journalists on their international travels. Allan G. Sleeman told a fellow reporter in his hometown of Christchurch, New Zealand, in December 1928 that a portable typewriter was more important to him than the clothes on his back. At the time, "Scoop" Sleeman was just 23 years and six months old. And he was already a New Zealand celebrity – for his skills with that typewriter in writing stories which had exposed the underbelly of life in Sydney, Australia - and had earned the young Sleeman the occasional black eye for his troubles. But this was only the beginning of Sleeman’s illustrious journalism career – one which would take him, and his typewriter, to fame in Canada, the United States and England. 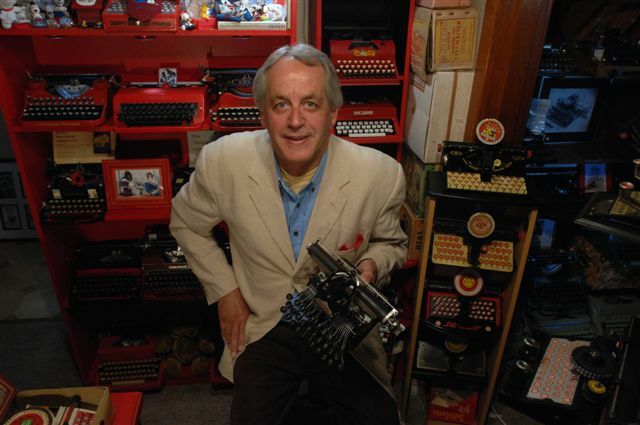 When I started out in the newspaper game, more than 40 years after Sleeman, it was constantly stressed on me that once I had established my credentials as a New Zealand-born reporter with a typewriter, the world would be my oyster. There’s been many a time when I have sat in fancy restaurants in distant places, supped on oysters at the expense of my company, and reflected on how accurate that advice had proved to be. New Zealand-trained journalists, it was once commonly believed, could command jobs anywhere in the English-speaking world, such was their reputation for having received the very soundest of groundings available. Indeed, even beyond the English-speaking world, on English-language newspapers in such exotic places as Argentina, Egypt and Japan. Little did I know at the time that Allan Sleeman had been the pioneer, the trendsetter for all this. He had long since blazed a trail across the globe, establishing the fine reputation for reporters from his homeland that was to endure for at least the next half century. Today I pay Sleeman due homage, as he unquestionably helped to make my early career of rich experiences just what it was. Allan George Sleeman, born in Christchurch on June 27, 1905, studied journalism at Canterbury University and began his career on the Christchurch Star in the early 1920s. He read of the lives of Jack London and Ernest Hemingway and longed to follow in their footsteps. While the Star offered ample opportunities for Sleeman to develop his all-round reporting skills, he soon saw that, armed with his portable typewriter, he could travel to and survive in many far-flung places. At just 21, Sleeman was selected to cover for the London Daily Express (and New Zealand newspapers) the tour to New Zealand by the Duke and Duchess of York (later King George VI and Queen Elizabeth, the queen's mother), in February-March 1927. On February 17, 1928, aged 22, he sailed from Wellington for Sydney on the Marama. In Australia Sleeman quickly established a name for himself as freelance investigative reporter, and young man willing to live in and expose Sydney’s seediest quarters. Sleeman briefly returned to New Zealand at the end of 1928, but for the next 10 years was constantly on the move around the world. Few if any Antipodean reporters in that era better exemplified the expression “have typewriter, will travel”. He sailed back to Sydney, then on to Vancouver and San Francisco. Sleeman reached London in May 1930, then returned across the Atlantic to New York. While Sleeman was on his way to England in 1930, back home in New Zealand his astonishing exploits as a newspaper reporter – bear in mind he was still just 24 - were making headlines in the Auckland Star and the Wellington Evening Post. In 1932 Sleeman was back in Sydney, where he married Julie Rennell Lancaster. With war looming, he returned to Christchurch in 1938 and enlisted in the New Zealand Army in 1943. After the war Sleeman lived in Lyttelton and worked in radio in Christchurch, but his wanderlust was unabated, and he once more travelled overseas, to London and New York. Finally Sleeman returned to Australia, lived in Mosman, Sydney, then retired to the life of a farmer at Duranbah on the Far North New South Wales coast. After his wife died, he settled in Tweed Heads, where he lived in 1980. Very interesting post about a very interesting fellow. This is the first I heard of Mr. Sleeman and I am glad I did. More reporters of our day should be like him. You too Robert. You are up there along side him when it comes to good writing and reporting skills. I was amazed to see your blog on my father, Scoop Sleeman. You will be pleased to know both both my late brother and I followed him into journalism, though I am behind a camera. I was amazed to read your blog about my father A G Sleeman. You will be pleased to know both my late brother and I followed him into journalism, though I am behind a camera.